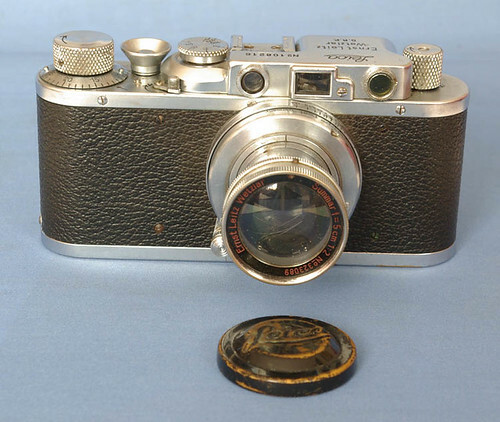 The Leica II, introduced in 1932, is the first Leica model to include a coupled rangefinder. This was such a desirable feature that some owners of Leica I cameras returned them to Leitz to have the rangefinder added (as illustrated below). At first the cameras were finished in black enamel with nickel fittings. 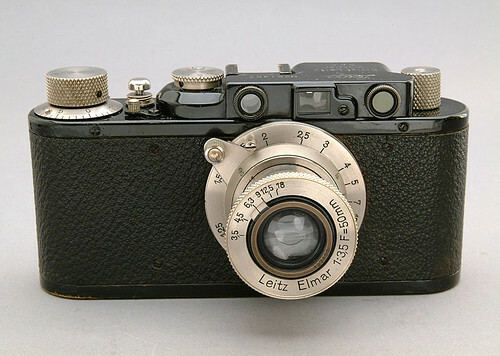 The following year they were available in chrome, the first Leicas to be made with a chrome finish. Black model IIs account for about 2/3rds of the total production. While the Leica III in 1933 offered the advantage of slow shutter speeds the model II continued in volume production until 1939 with a few made later. It could also be factory converted to model III. Serial number range 71,200 to 358,650. ↑ P-H van Hasbroeck, The Leica, (Sotheby 1983; ISBN 0-85667-171-1) Page 64. British Patent 371252, Improvements in or relating to photographic cameras, filed 1931 and granted 1932 to Ernst Leitz GmbH, describing the machanism for coupling a rangefinder in a fixed-lens small-format camera. British Patent 379954, also titled Improvements in or relating to photographic cameras, filed and granted in 1932, describing improvements to the design to allow the rangefinder to serve interchangeable lenses without adjustment when the lens is changed. This page was last edited on 31 January 2017, at 04:55.